Yesterday, in the final moments before the start of Hanukkah and with less than 100 hours to go before Christmas, Counterfeit Chic inadvertently became part of the river of humanity flowing past and through the aisles of Macy's Herald Square flagship -- and noticed surprisingly few shopping bags. Sure, there were tourists photographing one another both inside and outside the store, but the store clerks were practically leaning their elbows on the cash registers and yawning. Retailers are doing crap business, we're told, but the knockoff guy outside Macy's right now has a line a block long. 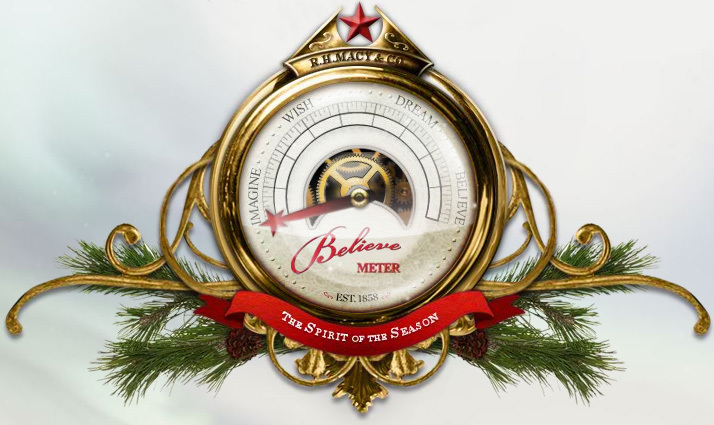 But hey, maybe Santa will provide an 11th-hour retail rescue -- Macy's still believes. Happy Birthday to Me -- 3! Counterfeit Chic is three years old today! Many thanks to all of you, from the wonderful and engaging readers who make late night blogging a pleasure to the fabulous fellow bloggers like Settle It Now and Current Trends in Copyright, Trademark, & Entertainment Law who have recently named Counterfeit Chic among their must-reads. 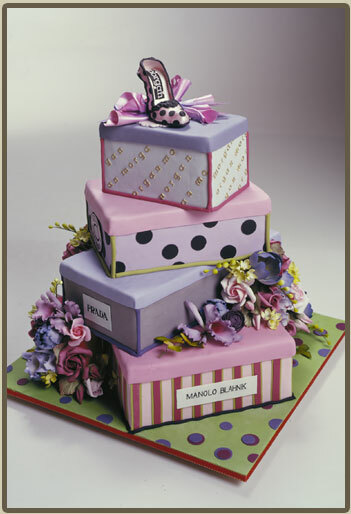 To celebrate, here are three tiers plus one to grow on -- exquisite, but alas presumably counterfeit -- from Ron Ben-Israel Cakes. Any volunteers willing to help dispose of the telltale trademarks? Think you're having a bad fashion day? It could be worse -- at least you're probably not one of the poor souls identified on the pages of Glamour magazine as a cautionary "don't," your identity semi-protected only by the addition of a black anonymity bar across your eyes. While Counterfeit Chic usually considers Glamour Dos and Don'ts to be a public service, every now and then a member of this august fashion police force turns out to be a rogue cop. Among Glamour's televised "20 Wedding Dos and Don'ts" is an important fashion "don't": Don't go broke on your wedding dress. No argument here. Yes, the dress should be incredibly flattering and worth saving for your granddaughter someday. No, you shouldn't let the wedding industrial complex convince you that your future marital happiness is directly proportional to the price of your gown. Some of the budget alternatives suggested on camera include buying secondhand (after all, your pre-owned dream dress was probably only worn for a few hours -- if at all) and looking into your favorite designers' or boutiques' sample sales. And by the way, there is also a wide range of long, white dresses available without the premium that seems to accompany specialty sales; my own dress was a satin evening gown that the designer happened to have created in white. Nontraditional color/style choices may yield even better bargains. Legal, yes, at least in the U.S. But it's no wonder that bridal boutiques ban cameras and wedding dress designers resort to copyrighting lace designs and touting the value of authenticity in an effort to gain some traction against design pirates. Tradition may call for the bride to wear something old, something new, something borrowed, and something blue -- but it's probably better wedding karma if the "borrowed" item is loaned voluntarily. It's been a while since Counterfeit Chic and friends have caught Forever 21 with its hand in the design cookie jar -- but it looks like the fast-fashion chain may be reaching for a holiday treat in the form of a knockoff Balenciaga bag. And we do mean almost the exact form. 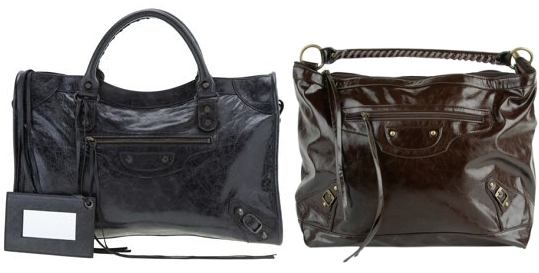 The righteous Jennifer Moreno over at BagBliss sent word that F21 has come up with a "tragic bag, that's sure to tick off any devoted Balenciaga-lover." It's all there -- the angled Balenciaga corner buckles, the distinctive half-moon patch design, the extra-long zipper pulls, even the whipstitching below the handle, all in not-so-luscious faux leather. Only the slightly altered proportions of the knockoff (below right -- but you knew that) and the manner in which the handle is attached reveal the truth. During the current economic meltdown, Balenciaga's classics are among the few things NOT marked down to drastic levels, a fact that F21 may have noticed -- and one that makes this copy even tougher for beleaguered retailers to take. But is it legal? F21 probably hasn't run afoul of copyright this time, but such a distinctive, instantly recognizable design is a prime candidate for trade dress protection. When the design is so familiar that it doesn't need a label, copyists beware. And F21 -- once again, what were you thinking? There's so little intellectual property coverage for fashion designs under U.S. law, yet you seem to repeatedly reach for the protected bits. How many times has Mom told you to keep out of the cookie jar? Not yet convinced that Balenciaga is as distinctive as, say, Gucci's stripes and horsebit or Chanel's quilting and chains? Check out Mary Ping's interpretation for Slow and Steady Wins the Race, her fascinating, limited-edition mediation on culture, mass and class, and the "creative progression of clothing design." 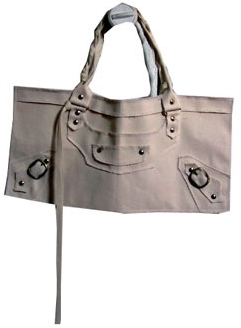 If she can create a canvas shadow version, then Balenciaga is clearly part of the pantheon of purses. Many thanks to Jennifer Moreno for the F21 tip and to Marie Choi for reminding me about the Slow and Steady Wins the Race project! Like other artistic media, fashion is engaged in a constant struggle between the creative and the commercial -- and lately it seems that the commercial is winning. While Damien Hirst isn't painting pastel seascapes for Florida hotel rooms and Philip Glass isn't composing advertising jingles, avant-garde fashion designers are under pressure to make their work merely pretty and wearable, in part because of the difficulty of maintaining exclusivity. In a recent article, the Dutch design duo Viktor & Rolf note, "In our information society, mystery is very hard to maintain, and what is avant-garde today is mainstream tomorrow. 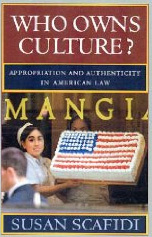 It can be copied and marginalized very easily." The upside? Viktor & Rolf exploiting their name recognition to knock themselves off for H&M. The downside? A design duo that once showed high-concept atomic bomb silhouette couture instead offering frilly blouses and beaded dresses for Spring 2009. Intricate and beautiful, yes; progressive, no. 'Tis the season for stockings to be hung by the chimney with care -- but first, they have to be found, taken out of tissue paper, and inspected for leftover lumps of coal from last year. In many homes, this involves a trip to the attic or the basement, where slightly battered cardboard boxes marked "Xmas" hold happy memories. New York apartments, however, typically lack such generous storage space, and it was thus that I found myself at a local ministorage facility over the weekend, searching for my favorite stocking. While surveying a stack of boxes that look like something from an Indiana Jones movie and trying to remember where the Christmas ornaments might be, I overheard a heated negotiation in an adjacent area. Someone was obviously planning to buy a large quantity of something from someone else -- well outside of the usual wholesale channels. "Don't you like me, man?" "Of course, I like you. But I can't do more than five. The economy, man." "OK, seven fifty. I have everything you want -- J'Adore, No. 5, everything." [Aha! Perfume! And presumably either counterfeit or grey market (genuine trademarked goods flowing through unauthorized channels), unless Dior and Chanel are doing business through the same ministorage-based rep. And $7.50! On the street, these guys ask for at least $40 or $50 and usually get $25 or $35. Madison Avenue could use margins like these at the moment. "Anything else you want, my friend? I can get electronics, iPods." "They all come from China, man. All the good stuff." "OK, man, this is good. I'll find you." At this point it occured to me that my Christmas stockings might well be at home, put away with the seasonal table linens, rather than boxed in storage. And in any case, I was in need of a good, stiff hot chocolate. As I waited for the incredibly slow freight elevator, a man rolled up beside me with a stack of boxes on a dolly. I couldn't resist a sideways glance. They were plain brown boxes, about the size one might use for office files but a bit flatter, with crooked handwritten notations of the contents: D&G, DNKY, and, sure enough, No. 5. I thought it the better part of both wisdom and elevator etiquette to remain silent and nod politely, though as we exited on the main level, I glanced back at the posted rules and regulations for the storage area. Near the bottom of the list was a prohibition on storing contraband -- though whoever wrote it had banned "trademark-infringed goods" rather than "trademark-infringing goods," which would technically leave my neighbors in the clear. Still, the law of the land and the law of the ministorage facility are not identical, and I had clearly overheard a deal not likely to be burdened with customs duties, sales taxes, or the usual formalities of commerce. And I know exactly what I don't want to find in my stocking on Christmas morning. Bratz dolls could be this season's hottest holiday gift -- if only because after the first of the year, they may disappear forever. Yesterday's court ruling in the ongoing battle between Mattel's Barbie and MGA's Bratz confirmed an earlier jury finding that the original Bratz fashion dolls and the "Bratz" name were created by a Mattel employee and thus belong to Mattel. The judge also concluded that, while the jury was not specific as to whether it found only the original set of four Bratz dolls or their many subsequent siblings to be infringements of Mattel's copyrights, the court's own evaluation of the expressive elements of the works showed all of them to be substantially similar to the original drawings. Bratz may be plastic, but apparently "minimalized doll noses" run in the family. 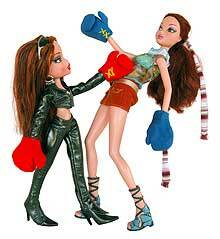 The court enjoined further production and sales of Bratz dolls, but stayed the injunction until a February hearing. Moreover, there's likely to be an appeal. Still, collectors take note: the charmed adolescence of Barbie's chief rivals may be nearing an end. The intellectual property bar has lost a spirited champion with the tragic and unexpected passing of Marya Lenn Yee. Long before I met Marya in person, I'd known of her and the legendarily powerful but compact "girls' IP boutique," Donovan & Yee, that she co-founded with Mary Donovan. What I didn't know is that she'd also co-founded the New York chapter of the Copyright Society -- and that she was not only a brilliant advocate who was incredibly enthusiastic about pathbreaking legal developments in her own practice and elsewhere, but also the go-to person for finding the afterparty. And when Marya was arranging an event, there was always an afterparty. What other named law partner would chair the only Copyright Society panel ever to include a fashion show -- and then offer to model if necessary? 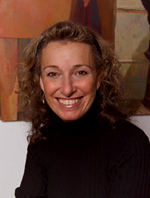 Marya will be remembered at a funeral service on Friday, December 5, at 12:30 pm, at the Plaza Jewish Community Chapel, located at 630 Amsterdam Avenue (at 91st Street) in Manhattan. Donations in Marya's memory may be made to SHARE. Counterfeit Chic's thoughts and prayers are with Marya's family and colleagues. Many luxury brands are increasing their online presence in an effort to boost sales -- especially this Cyber Monday. 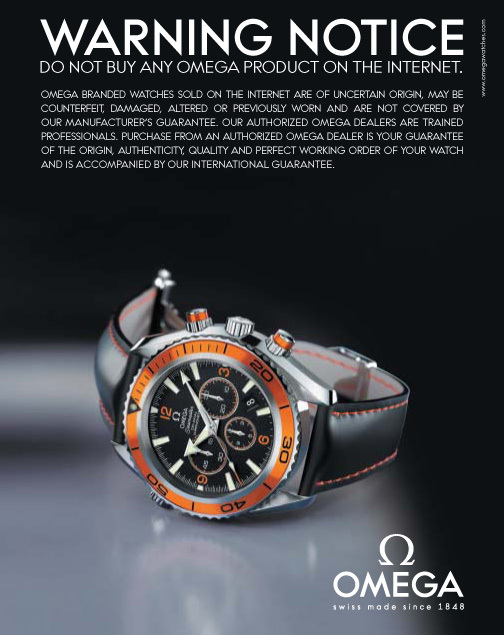 Omega instead took out a full page ad in today's WWD, advising shoppers to beware the internet lest they end up with watches that are counterfeit or otherwise substandard. True, distinguishing between real and fake online is a challenge -- but Counterfeit Chic is betting that while Omega may be the last word in watches, it's definitely not the last word in e-commerce. The 2008 Christmas Book is as creative as its predecessors, with the opportunity to immortalize the couple of your choice as life-sized LEGO sculptures in collaboration with artist Nathan Sawaya. Attorneys for Neiman Marcus obviously took a crack at The Book before it landed in lucky mailboxes around the globe, however. The item description includes the following caveat regarding your would-be blockheads: "Just make sure you have the rights to their likenesses; we're not here to judge." In addition to concerns about rights of publicity, the fine print notes, "LEGO and the brick configurations are trademarks of the LEGO Group. The Life-Size Replicas are not affiliated with or endorsed by the LEGO Group." Fair enough, given previous LEGO controversy. With the legal details out of the way, all you need now is USD $60,000 per sculpture plus shipping -- and a full-time nanny to make sure that Junior doesn't dismantle the artwork during playtime. On the other hand, the reconfigurable nature of the sculptures could come in handy in the case of a post-holiday breakup.